With daytime temps headed well into the 90’s and humidity to match, I left early for a kayak fishing trip on a local pond. I usually fish this water regularly, but this year I’ve decided to spend more time prospecting new lakes and ponds in the area. It was overdue for a visit. There was no breeze and the water looked almost like glass, broken only by sporadic rises. 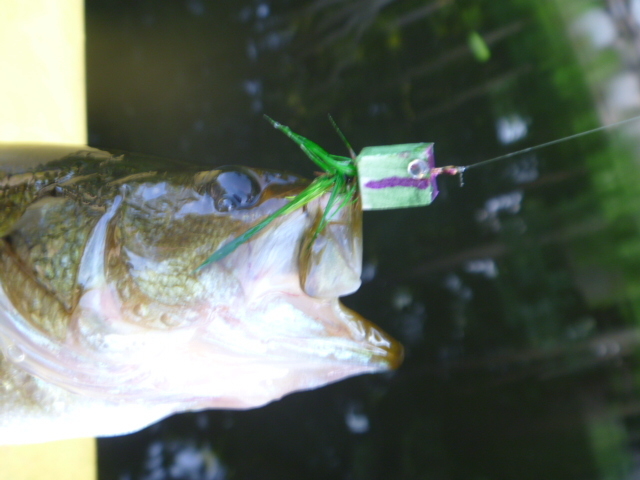 I was in the kayak and casting by 6 am. 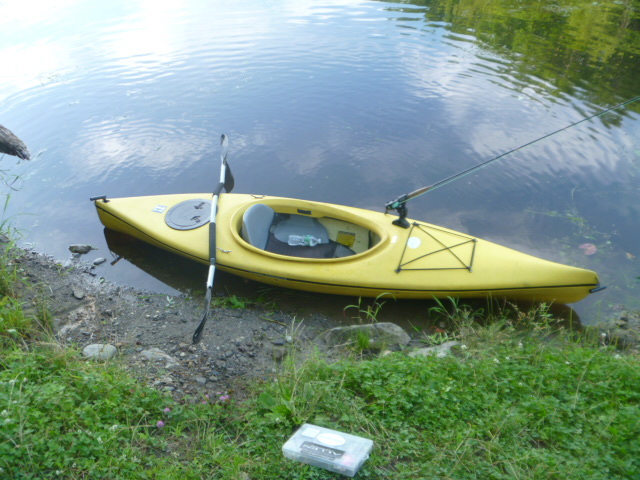 My equipment is basic: kayak, paddle, rod & reel, flat fly box, life jacket and a bottle of water. 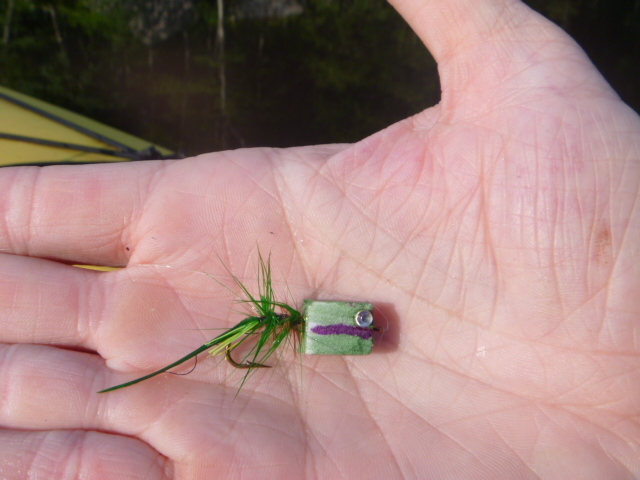 I’ve been experimenting with various bass and panfish patterns of cork and foam, and was happy to see a juvenile bass hit this homemade popper. This one was extremely easy to make. The dense foam rubber used for the block body came from packing material. I colored it with a sharpie, then added some green hackle. I added a set of small eyes that came from a craft store. The hook runs through the center of the body and is secured with super glue. This is just one of the areas where I found fish. 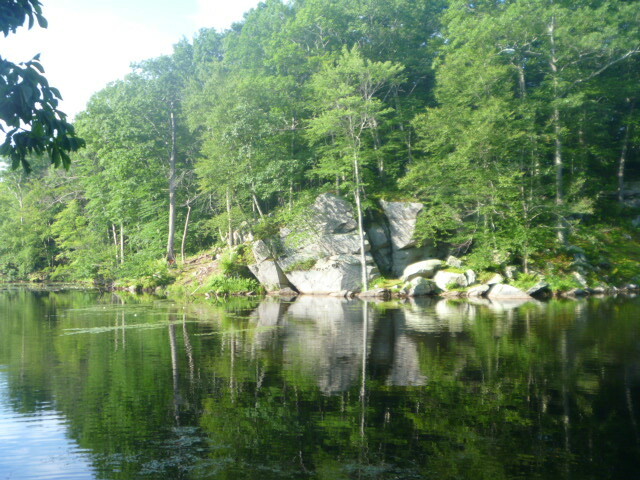 The rock ledge, water lilies and submerged log all held bass and bream. As the sun began to uncover more water, I decided to head back. Hope you’re getting out for some summer fishing. Enjoy! 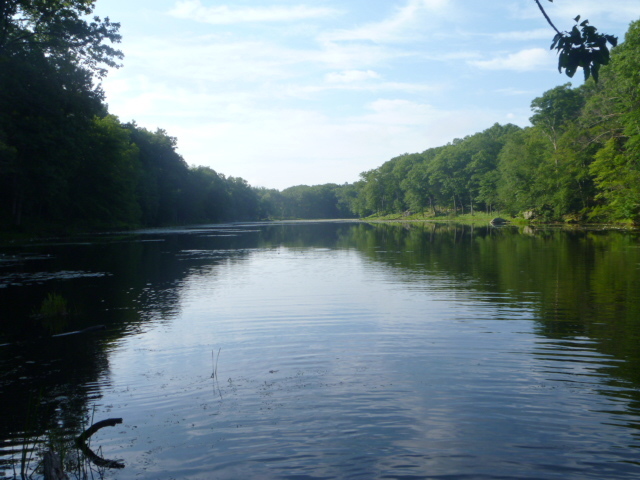 Looks like a fine place to paddle around and cast from a nice-lookin’ kayak!